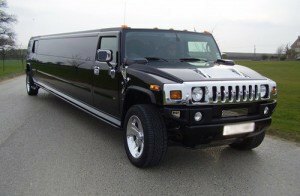 Whether you are planning for a wedding, party, prom or just a night out – the Hummer Rental H2 is the perfect choice of Limo. With an elegant modern interior and a dazzling exterior, the Limousine will make you feel charmed and important as you drive through the town. With enough seating space for 16 people and luggage space for 2-3 bags in the boot, the Hummer H2 Limo is perfect for a big party or even for traveling overnight. The fashionable and luxurious interiors will give your travelling experience a dramatic touch of glamour and eminence. The leather seats add an extra feel of comfort you need for a long journey. The Hummer H2 is built not just to make you feel comfortable, but also to pamper you with its advanced technological features. You can sit back and relax as you watch a movie on the television or listen to your favourite CD in the music player. The privacy window divider and custom lighting add a personal touch to the interior setting, making your ride truly special. You can look at the beautiful sky through the moon-roof or just sit back and talk through the journey. To make your experience richer, we also provide a complementary “well” bar with the Limousine. Contact us now and get a free quote now on our hummer rental at 020 3475 2693!